Arden Keren is the Queen and senior child of Oshun of Ile Baalat Teva in northern Israel.He has extensive academic and practical knowledge, and is an adept rootworker. Once you have established your relationship with Eshu, this is a good weekly ritual that you can do as an observance and prayer. Other Gatekeeper deities such as Hecate may like this as well. You should do this either on a Monday or a Friday, but not both. It’s something to be done no more than once per week so as to avoid disrespectfully pestering Eshu with rumination and obsession. It is a religious/deity centered way of prayer, not really witchcraft, but the remnants can be used for witchcraft. The energy built from faithful, consistent observance, also helps you maintain and boost your insua. The only ingredients you need for it are 3 sticks, cones, or pellets of incense of a sort that is pleasing to your Gatekeeper deity. Eshu is said to enjoy cloves, rose, lavender, coffee, vanilla, cinnamon, coffee, sakura, Opium perfume type, and other sweet-spicy scents. If you can, at least try to get some that is made with the natural ingredients or essential oils, or the good fragrance oils. You will also of course need a plate or incense burner, and a lighter or candle already burning on your altar. You will also need a flat surface that is not the floor, with a smooth surface you can roll things on. Open a window or a door to the outside, so that the air flows freely in and out of the room. 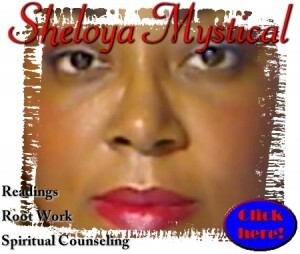 Get your burner in place, and ready your incense and lighter. Greet Eshu (or your Gatekeeper deity). Take the first stick of incense, and speak thanks to Eshu. Light it and then blow on it to get the tip glowing well. Place this stick in the burner, and take a moment to think about the things Eshu has done for you. Take the second stick, and place it on the flat surface. Roll it away from yourself 3 times, speaking things you want to banish from your life or do away with. One roll by the way, is one passage of your hand. Each time you lift your hand is one roll. It’s okay if it rolls back towards you a bit in this process. Just be mindful that if you suddenly lose your coordination, and it continually rolls back towards you and falls on the floor and chips or breaks, Eshu may be trying to tell you something…that maybe what you want to be rid of is there for a reason. Asking Eshu to make you wiser in this matter usually helps the uncontrolled rolling stop. He needs to know that you’re willing to do your part. After rolling, light the incense, blow on it, and place it in the burner. Take a moment to at least start actually letting go of the things you are giving away for Eshu to handle. Take the third stick, and place it on the surface. Roll this one towards yourself 3 times, speaking things you want to bring into your life. Again, if it keeps rolling away from you, there is a message in that. Ask for wisdom in helping you to get what you want, and things should stabilize. Light the incense, blow on it, and place it in the burner. Take a moment to open yourself to receive blessings, and ready yourself for the changes that come with them. Close the ritual by thanking Eshu for his presence, or continue with your usual daily observances. You may want to keep a notebook of these sessions so that when Eshu takes away something you wanted rid of, or brings you things you asked to receive, you can give him a bigger offering of thanks. It is important to thank deities with more than words. Arden Keren is the Queen and senior child of Oshun of Ile Baalat Teva in northern Israel. He has extensive academic and practical knowledge, and is an adept rootworker. elegua, eshu, eshu observance, eshu prayer, esu, gate keeper, gatekeeper, hecate, heimdallr. Bookmark. I practice with goetic demons and was wondering could I practice this kind of magick as well as practicing with demons? Will I be allowed to do that? Hello Aaliyah 🙂 That is a good question, and an important one. The simple answer is no, but the longer answer is more like not without some major adjustments. Practitioners of modern Quimbanda have found a sort of workaround, but it is very controversial since it takes syncretizing with Catholicism a step further into taking in their “dark” magic. This wouldn’t be such a problem, in my opinion, if those who practice it are aware of what they are doing. So if you’re going there, a few things should be addressed before you do. First, you are talking about entities that originated in the Canaanite pantheon a long time ago, and have no Christian sensibilities. Any control that you think you have over them is an illusion to ensnare you. You may think you’re playing them, but they’re playing you unless you treat them with the respect they deserve. So the Quimbanda filter their interactions with them by Exu. They don’t call the demon directly, but call the Exu of the demon. This way, so long as they are sincere and respectful, they are in less danger of being harmed, eaten, or driven crazy, or having their loved ones harmed. I suppose it’s based on the principle that since every living being has an Eshu in the west African systems, every being has an Exu in the South American diaspora systems derived from them. So every spirit and deity also has an Exu, so magic can be done more safely this way rather than arrogantly presuming the right to direct contact. 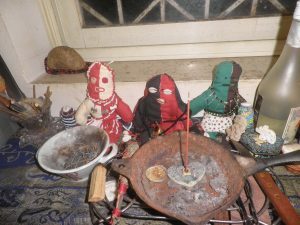 The three sticks ritual may be very helpful in maintaining your relationship with Eshu, Exu, and other Gatekeeper entities, so that you know where the borders are, and how to mind them. For the details on how Quimbanda practitioners manage Goetia, you should talk to them for some perspective from folks with experience working this way. You can be harmed or eaten by a demon??! It is unfortunate that you were not taught this. It is part of the introduction or first chapter of most older goetia books, and usually in the introduction of every working in grimoires. Most will tell you what can go wrong or at least what harm the demon has the ability to do. Some of them, even if you do everything right, once you open up a relationship with them (because they are definitely not robots or slaves in any way, not exactly as the Bible describes them, and may like you…maybe too much) that will not likely be the most pleasant experience to say the least. Since I live in Israel, I have learned to be very careful of these things because there are things that one can do that may accidentally open doors. If you want to work with demons or other spirits in the Canaanite pantheon, I recommend reading the Book(s) of Enoch and the Lesser Key of Solomon. You may also want to look into the translations of ancient texts from the middle east. Read the oldest writings on these matters for yourself, and don’t trust anyone else to tell you the whole truth, especially in this day and age where people are looking for an angle or shortcut.